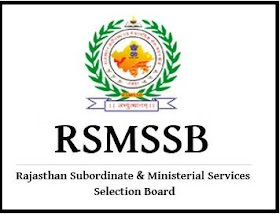 Rajasthan Subordinate and Ministerial Service Selection Board (RSMSSB) has invited applications for the post of Clerk and Junior Assistant. The eligible candidates can apply to the post through the prescribed format on or before 8 June 2018. Educational Qualification: The candidate should be 12th pass from a recognized Board or its equivalent and should have O Level Certificate Course by DOEACC/NIELIT. Eligible candidates can apply to the post through the online mode from 10 May 2018 to 8 June 2018. Candidates are advised to take a printout of the finally submitted online application for future reference.